We have been trying to ski as much as possible since its an outdoor family activity we can do in the winter when Tom isn't so busy. While Eva is young I stay behind much of the time, and when I do go I've been renting equipment, figuring I'd invest in some when I'm able to go more often. Tom and I recently discovered our old (we're talking 20-year-old equipment from high school) ski gear in my Dad's shop—gear we'd thought we'd ditched when we left college but Dad saw fit to rescue. 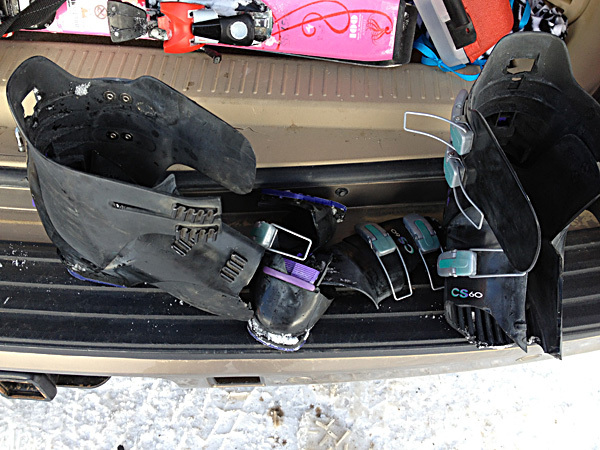 Of course, they are old straight skis that nobody uses anymore, but I thought my boots would be worth a try. I tried them on and they felt pretty good, despite the fact that was 3 kids ago and my feet have grown. So last Saturday I decided to give them a test drive on the slopes. But as we were gearing up, a piece of the boot broke off, taking a couple of buckles with it. I shrugged and trudged off to the rental shop, a little disappointed that I wasn't going to be able to save money on boots after all. After the day was over and I turned in my equipment, I slipped the old boots back on while I waited for Tom to pull the car up. While I waited I looked down and noticed the left boot had a crack in it also. Then I took a few steps to the car and the entire front of the boot popped off. I took a few more steps and the right boot did the same thing! Now picture me feeling all put together in my new name brand ski pants and then watching my ancient brittle boots literally fall apart before my eyes. It took my pride down a few notches. But then we had a good laugh over the pieces. At least it didn't happen on the slope!